Over the past year, I have been weekly journaling the blessings in my life as a way to see God at work. Reflecting on these blessings has opened my eyes to see the JOY in everyday life. I have watched the joy on my children’s faces as they experience something new or as they try hard to overcome a struggle. We have been blessed by so many wonderful things that sustain us during the more pressing times. Since the beginning of the school year, we have encouraged our kids to think about their favorite things from the day, and something that could have been better. I have grown to love these conversations with my 3- and almost 7-year-old! God is doing amazing work in our lives and when we look for it we will find it. Yesterday at my Disciple Bible Study class we discussed the three elements of corporate worship that have been passed down since Moses’ time. The three elements are Remembering, Atonement (the process of becoming one with God), and Thanksgiving. We spent our time talking about these elements in our lives and reflected that being thankful encompasses all of these elements because we are thankful for all that God has done in our lives, and continues to do in our lives. 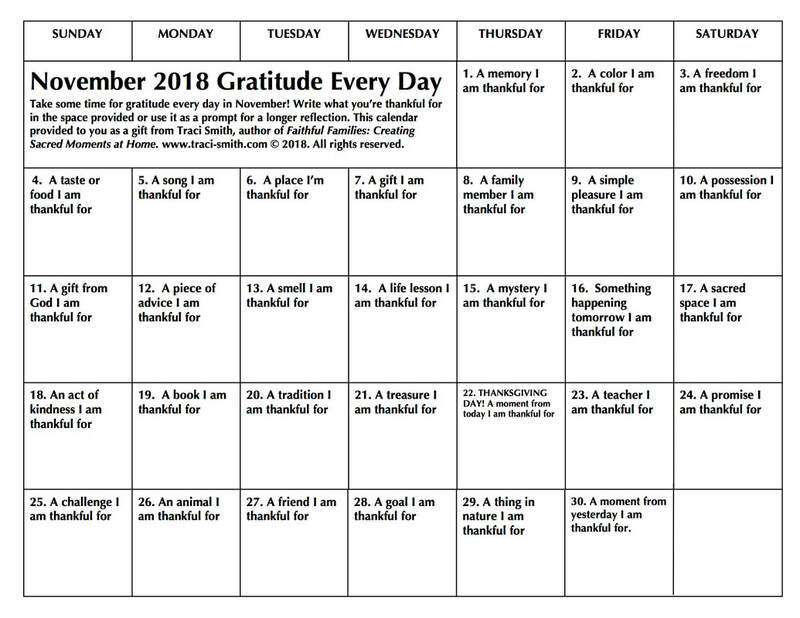 Will you join our class in participating in the Gratitude calendar? Let’s see how God is working in our lives. 1 Thessalonians 5:16-18 "Rejoice always. Pray continually. Give thanks in every situation because this is God’s will for you in Christ Jesus."